Young kids learn to spell "L-O-V-E" and "H-A-P-P-Y". "Extinct Is Forever", "Save The Earth" and "Let's All Be Green " encourage everyone to love Mother Earth! Get your body moving with "Dancing On The Beach" and "Stretching Time". Young kids learn how to spell "L-O-V-E" and "H-A-P-P-Y" while singing these two fun, up-beat songs. Cody & Bj love animals and we always encourage kids (and adults) to respect wild animals and to take care of Mother Earth. "Let's All Be Green", "Extinct Is Forever", "Save The Earth" are all rocking tunes about our beautiful planet. 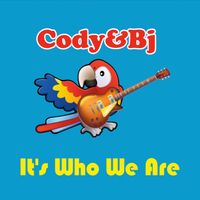 No Cody & Bj album would be complete without dancing songs and "Stretching Time" will have you moving and grooving. Cody & Bj perform these songs at their interactive live shows every day. Kids, parents, grandparents and friends love the lyrics and the pop-rock vibe.